THE Antrim club Championships get underway in earnest this weekend with three games down for decision on Saturday. Ahoghill hosts the opening games of the 2016 Intermediate Hurling Championship with last year’s junior champions, Rasharkin taking on Gort na Móna at 5pm before Glenariffe and Sarsfield’s do battle at 7pm. Sarsfield’s also plays host to the Junior B Hurling Championship final between Michael Davitt’s and St Agnes’ at 6.30pm (TBC). While the aforementioned teams have experienced vastly different fortunes during their respective league campaigns so far in 2016, Championship season is an opportunity to kick-start the year. Gort na Móna only appointed a manager last week and new boss Paul Lennon will be keen to make an instant impact. 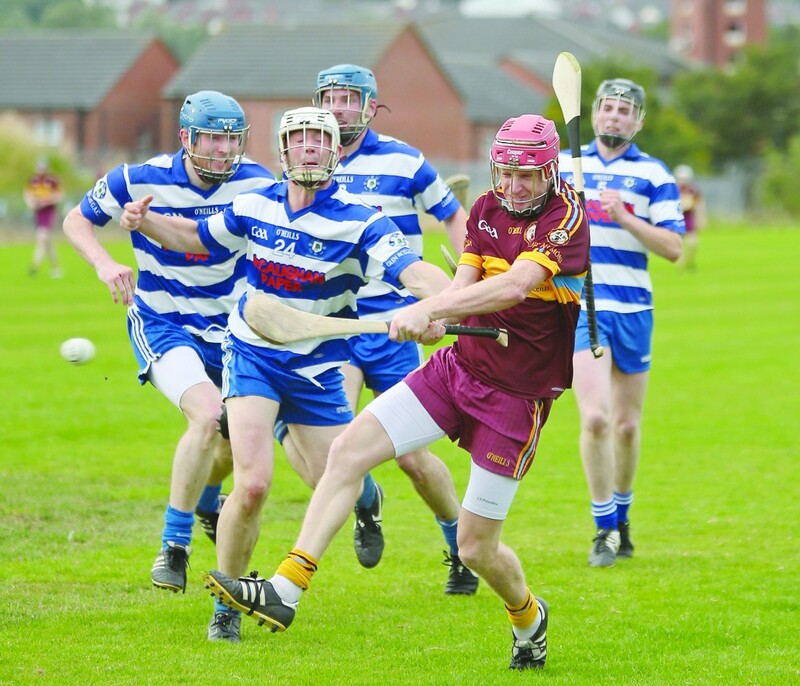 The Turf Lodge men have won just two games so far in their Division Two campaign, but they came agonisingly close to reaching the Intermediate decider last year when they were pipped by eventual champions Creggan in extra-time of their semi-final clash in Dunloy. However, Rasharkin have also shown fine Championship pedigree in recent times. Paul McFerran’s side reached the final of the 2014 Junior Championship but lost out to Glenravel. Last year, they went one better by defeating St Teresa’s in the decider. St Mary’s will be massive underdogs but they are not to be underestimated. Yet, the return of former county panelist Desy McClean should help sway the game in favour of Gort na Móna. Later on Saturday evening, fellow West Belfast side Sarsfield’s will be hoping to progress through to the quarter-finals at the expense of Glenariffe. Few teams outside of the top tier boost as talented a panel as the Paddies, but injuries and absenteeism have taken their toll in recent years. On the cusp of reaching the Senior Hurling Championship final two years ago, back-to-back relegations have Sarsfield’s battling in Division Three this season. Despite this, Sarsfield’s will be hopeful of making an impact in the Intermediate Championship this season. Antrim stars Daniel McKernan and Niall McKenna would grace any team in the county, while former county minor Jack Daniels has been in great form this season. Current Antrim minor star Donal McKernan played a key role as the Saffrons defended their Ulster title and his club manager Kevin McKernan says he is likely to feature on Saturday given the number of players who are unavailable. “It is just one of those years with boys getting injured – if it wasn’t for bad luck we would have no luck at all,” said McKernan. “Daniel (McKernan) is only back. He is broke his finger this year, he has broke his hand and he has broke a kneecap. Our Championship game last year was at the end of August but this year it is the end of July. People are booking holidays from before Christmas, but you don’t get the fixtures until March. “Donal (McKernan) is a minor but we are going to have to play him – we are short. “He is capable enough. If you are a county minor, you are fit to play senior, especially at Intermediate level. “Big (Niall) McKenna is back from his holidays. Bar Ciaran Clarke, he is the best forward in the county this year.” Glenariffe have been holding their own in a competitive Division Two this season. “If we had a full team, I would be confident going into the Championship. We are the underdogs this year. If we have a full team, we are a very good Division Two team. “Our aim this year is to try and get out of Division Three. It is a long season and we are a dual club. If Sarsfield’s click, they are more than capable of upsetting the odds against their North Antrim opponents. Meanwhile, the Junior B final is a repeat of the 2015 decider as West Belfast rivals Davitt’s and St Agnes’ clash for the right to progress to the Junior Championship. The Aggies accounted for O’Donnell’s in their semi-final last week, winning 0-15 to 0-13 while last year’s Junior B winners beat Loch Mór Dál gCais 5-18 to 1-7. Davitt’s claimed the Junior B crown with a three-point win in last year’s decider while the same margin separated the sides in their league meeting in April. However, Aggies turned the tables on their most recent meeting earlier this month – winning by a single point. Another close battle looks in prospect for the city rivals.